"Do the knowledge", was something that Brand Nubian would say often. The socio-political hip-hop group from New Rochelle was both influential and innovative. Throughout the years, Brand Nubian have expressed their love of knowledge and tried to teach and uplift the community. Brand Nubian have been innovators in conscious hip-hop since the late 80's and they have always managed to keep their street credibility in tact. Their first LP, "One For All" included Brand Puba, Sadat X, and Lord Jamar. With a pro-Black attitude and an energy to uplift the culture, songs like "Slow Down" and "One For All" became hip-hop classics. Grand Puba left the group to go solo. He had a hit with "360 (What Goes Around)" but never scored big again with his follow up solo albums. At the time, Brand Nubian consisted of Lord Jamar and Sadat X. 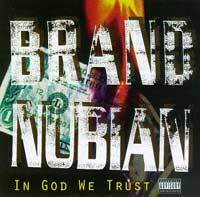 With the classic album "In God We Trust", Brand Nubian developed with a much harder sound. Songs like "Punks Jump Up To Get Beat Down", "Steal Ya Ho", and "Love Me Or Leave Me Alone" also became classics. Eventually, Brand Nubian released their last album on Electra Records, "Everything Is Everything". The themes and sentiments were much more intense and angry. They incorporated live instrumentation and somewhat of a West Coast gangsta sound to their music. Even though the album did not sell well, some true fans (like myself) consider it brilliant. Sadat X's "Alladat" with Busta Rhymes is mind-blowing. "Down For The Real" is eerie and aggressive while "Straight Off Da Head" shows their freestyle skills. Sadat X recorded a solo LP "Wild Cowboys" that spawned the hit "The Lump Lump". Years later, he also released a tight EP. People always wanted Grand Puba to come back to the group. In the late 90's, the original Brand Nubian were back together and they signed to Arista. "Foundation" was a tight, mature album with production by DJ Premier, Lord Finesse, Alamo, and others. They earned their respect and more exposure. Lord Jamar began producing for other artists. He produced beats for Buckshot of Black Moon, Heltah Skeltah, Artifacts, and some classic work on "Let's Get Free" by Dead Prez. Still, Lord Jamar was the only Brand Nubian member to never put out a solo album. He was the only one to land many acting jobs. He landed a role as Supreme Allah on the HBO prison drama 'Oz'. Lasting longer than any other rapper on the show, Jamar was eventually killed off but his character made a huge impact. Fast forward to 2004. Brand Nubian (as Grand Puba, Lord Jamar, and Sadat X) signed to Babygrande Records and released "Fire In The Hole". Babygrande (home of Jedi Mind Tricks, Canibus, and others) is an independent label that gave the group more space and creative freedom. "Fire In The Hole" is another mature work of thought-provoking songs that uplifts the listener and carries them through a rough day. Lord Jamar practically produced the entire album with some help from Alamo, Sadat X, and Grand Puba. "Young Son" imbues intelligent advice from a father to a son. "Still Living In The Ghetto" displays the hardships of the struggle. "Soldier's Story' is about the violence in impoverished areas. "Where Are You Now?" is about loyalty. The themes are universal and profound. On a warm Autumn evening in 2004, I had a long conversation with Lord Jamar. While some people thought Brand Nubian were racist towards white people or homophobic, others reveled in their anger and found it justified. As a group, Brand Nubian feel that their anger is directed towards people who oppress others. Spiritual, intellectual, and emotional, Lord Jamar had an honest and intelligent conversation with this white man. With mutual respect, we shed some light on hip-hop, racism, the music business, acting, and much more. If knowledge is the foundation to everything, Brand Nubian's foundation is incredibly strong. Lord Jamar is ready build a brand "Nu" hip-hop nation. MVRemix: I've been a fan since 'One For All' but I must say that I love the album 'Everything Is Everything'. Lord Jamar: Thank you very much, man! I don't know. The initial reaction to that album was that they didn't understand it. There is a small segment of the population that tells me that they think that is the best album we ever did. They really love that puppy. We were just trying to experiment with styles and a lot of live sh*t too. MVRemix: Your new album is called 'Fire In The Hole'. Tell us about it. Lord Jamar: The title was something that Grand Puba came up with. That was kind of like a warning. When that grenade comes in the foxhole, people say 'Fire in the hole!' and people get out of the way. It is kind of like a metaphor for what is going on in the world as well as the music we are putting out. MVRemix: Like the album 'Everything Is Everything' and 'One For All', the album 'Fire In The Hole' is mainly produced by you. 'Foundation' you had other producers. What made you handle most of the production for 'Fire In The Hole'? Lord Jamar: Well, I guess we were just trying to get back to basics. On the first album 'One For All', we all produced it but we were not hands on. Some people were telling us what to do and blah blah blah. Then, on the second album, 'In God We Trust', I really got hands on in terms of production. Most of our albums, I did the production. MVRemix: Do you have a favorite drum machine? Lord Jamar: The MPC 3000. MVRemix: If you had to choose between rhyming and making beats, what would you choose? Lord Jamar: Wheew! That's a good question. I don't know. I am kind of semi-vein in nature. The emcee thing is what puts you out there for people to see and all that type of sh*t. The producer of beats is more background, which I don't have a problem with. I don't know. That's a hard choice. I love both. MVRemix: Grand Puba and Sadat X all came out with more than one solo album. What about your solo album? Lord Jamar: I'm doing one on Babygrande. I'm just waiting for the right time. I don't want to waste my chances. I have some sh*t done already. MVRemix: You are now signed to Babygrande Records. How did you and Brand Nubian hook up with them? Lord Jamar: Sh*t, I have 2 brothers and my middle brother is wise and young. He knew this guy Chris, who worked at Koch. They put out Grand Puba's 'Understand This' album. My brother knew this guy from growing up in New Rochelle. That is where we grew up. This guy knew Chuck Wilson at Babygrande. My brother and him were kicking it. One thing led to another and they started talking. At the time, we were looking to do something but we didn't want to do it unless it was going to be done right. We liked his enthusiasm. He was another guy who thought that 'Everything Is Everything' was his favorite album. Everybody usually likes the first one. That album was just so new for the time. Whether it is Snoop or someone else, the first time you heard a hot emcee, you can never capture that again. MVRemix: Can you explain the term or title 'Everything Is Everything'? Lord Jamar: That was a phrase we were saying at the time amongst ourselves. Especially Sadat X said it. 'Everything Is Everything' kind of meant that it's all good. Everything in the world is everything. Exactly. It's kind of ambiguous in a way. MVRemix: Do you have a favorite album? Lord Jamar: I kind of love them all. They are like my children. They all have a distinct thing about them that makes you love them. I think 'In God We Trust' was a milestone because Sadat X and I had to learn how to do a show on our own without Grand Puba. MVRemix: When Grand Puba left, how hard was it? How did you adapt? Lord Jamar: We adapted. We tailored the show to two people since it was originally supposed to be three people. We had to chop it up. We did a lot of scotch tape sh*t with the first album. Puba kind of left us at the end of the first album. The new album wasn't out yet. Once we got 'In God We Trust' out, we had more material with just Sadat X and me. It was a little struggle at first. We would go to shows and people would shout out 'Where's Grand Puba?'. By the time we finished the show, they loved it and everyone forgot about it. Also, at the time of the first record, people were trying to take advantage of us. This guy did some production on the first album. He's still my man so I don't want to bring his name up. He did a song on the first album and was always cool with us. He thought that he was going to be the producer and he was going to try to exploit us. He did a beat and the price was crazy higher than it should have been. For that price of one beat, we could buy equipment and make all our beats at home. I know for a fact that my beats are hotter than these dudes. He was trying to get us for money and I wasn't going for that. Sadat X and I went half on equipment and we did it on our own. We had mad records. MVRemix: When you do a song, do you come into the studio with pre-written lyrics or a theme in mind, or do you hear the beat first and write then and there, in the studio, from the beat? Lord Jamar: I usually write from the beat but sometimes, I have a concept of what I want to do before I do it. Most of the time, I write from the beat. Most of the time, the beat will tell you what the song should be about. On 'Claiming I'm A Criminal', there is a part that is looped where it says 'Been thrown in jail more than a 100 times'. Right there, that led me to what the song was about. MVRemix: Do you have a favorite song on 'Fire In The Hole' LP? Lord Jamar: I have a few. One of my favorite songs on the LP is 'Soldier's Story'. I'm not sure about the response to that song yet but I love that song right there. 'Still Living In The Ghetto' and 'Young Son' I like. 'Where Are You Now?' is another one I like too. MVRemix: The song 'Claiming I'm A Criminal' shows the realism of jail and being arrested. Do you have cases pending or issues with the court now? Lord Jamar: Nah. I'm good. Sometimes, I do write in a character. MVRemix: How did you get involved with the show 'Oz'? Lord Jamar: That was beautiful. That was like getting paid to go to acting school. My main Dean Winters, who plays Ryan O'Reilly, introduced me to the creator of 'Oz'. I used to talk to Dean on the phone here and there and one day, he said, 'Tom wants to meet you'. I went down there and we started talking. He said, 'You're definitely going to be on the show. We'll have a character for you and figure out a way to get you into jail'. I told him about the 5% Nation and he was intrigued by that. I basically came up with my own character, my own scenarios and how I got in there. He just took it from there. MVRemix: How has 'Oz' helped your career? Lord Jamar: It definitely introduced me to people I would have never have known. There are some 50 or 60 year old white women who see me in Manhattan who say 'Supreme Allah!'. They don't know anything about Brand Nubian but they know me from 'Oz'. If I did a bad job, they would have killed me off earlier. I lasted a season and a half. It was more than any other rap dude. MVRemix: Actually, Method Man was only in a couple of episodes of 'Oz', right? Lord Jamar: Yeah, he was in there, kind of, because of me. His character was there because of what my character did. My character, Supreme Allah, killed Method Man's character's brother. MVRemix: What other acting have you done since 'Oz'? Lord Jamar: Since then, I did some independent films. My man Mums The Poet and I did a film called Morning Breath. It is kind of an artsy film. There isn't any dialogue but the whole thing is one of his poems. We're basically acting out one of his poems. MVRemix: Did you cut your dreads? What has the response been to that? Lord Jamar: Yes, I did. I cut my dreadlocks. At first, people were like 'Ah, why did you cut them? You should have never done that!' Then, some people were like 'Yo! You look 10 or 15 years younger!' Now people are just used to it. I had them for 12 years. I tell people with dreads, 'When you have your dreads for 12 years, come back to me and we'll talk about it.' So many things go on in your life and honestly, certain energies can get locked up in that sh*t.
MVRemix: How old were you when you got involved in the 5% Nation? Lord Jamar: I was about 14 years old. MVRemix: In 'Everything Is Everything', there is an intense anger. I consider it an angry album. Some may feel that the anger is directed towards white people. Do you still have anger towards white people? Lord Jamar: The anger was not just towards the white race. It was towards the oppressors. Whoever is into oppressing anybody, I get angry about that. I do not go for the oppression of women or anybody. There are poor people who get oppressed all over the world. I have been to Nigeria and I saw Black on Black oppression. We have to keep it real. Did you ever read the book Stupid White Men by Michael Moore? If you keep it real and look around the planet Earth, the ones who are doing the most oppression towards people are white men. I didn't tell them to do that. As far as dealing with the average white person on a daily basis, I know that the average white person is being lied to and oppressed the same way that Black people are being lied to and oppressed. It is really about the haves against the have-nots. I see the poverty levels and I see how we really have not risen over the years. We are pretty much in the same place we have been in for a long time. You look on the TV and you see the fabulous life this one or that one. They see all the money that people have. Bill Gates has billions of dollars and all of that. That is obscene! MVRemix: In Africa, some people are getting their hands chopped off for diamonds. Lord Jamar: Exactly!!! Babies!!! We are helping to facilitate that! That angers me as far as oppression, and lying and hiding of information in order to control people. MVRemix: You and Brand Nubian have always been considered a conscious group. You are for the forward movement of the Black race. What are the 3 main things that the Black race or the Black culture needs to do as a people? Lord Jamar: As a culture and as a people, the main things we need are knowledge, wisdom, and understanding. We need the knowledge in order to uplift our condition and so that nobody can pull the wool over our eyes. Then, we can have the wisdom, which is the act of putting that knowledge into motion. Understanding is a product that comes from that wisdom. We need knowledge, wisdom, and understanding. All those other things like unity that comes under that umbrella. Knowledge is the foundation of all things.